Do you often experience stiff joints and pains that make you do nothing but sit down and rest? These manifestations are often a result of aging, even if you do not suffer from particular conditions involving your joints. When strong medication is not recommended, you can still take supplements, to help your joints regain their lost mobility and you to get moving and get healthy again. Nature’s Bounty Joint Support Complex is such a supplement that combines the potency of various clinically tested ingredients for sustaining joint health, and recovering lost cartilage. There are positive reviews from users, so this supplement is worth taking a closer look at. 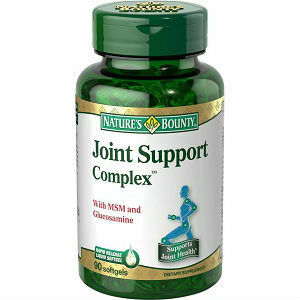 What Does Nature’s Bounty Joint Support Complex Contain? It is worth noting that these figures are reported for one serving, which consists of three capsules. The presence of glucosamine and MSM is a good sign, but we notice that this product does not contain hyaluronic acid, which is particularly helpful with reversing aging, by improving the quality of the synovial liquid in the joints. The recommended dosage for Nature’s Bounty Joint Support Complex is three capsules daily, to be taken preferably with a meal. The price per one 90 capsule bottle is 18.70USD, which is on the cheaper side. Since you must take three daily, this represents the dosage for one month. There is no clear guarantee offered on the manufacturer’s website, and, since the product is sold through online third parties and brick and mortar stores, this is something you may need to discuss with these retailers. Since Nature’s Bounty Joint Support Complex enjoys many positive reviews from users, it looks like a good, reliable product. It contains many of the recommended ingredients for promoting healthier joints, yet we cannot help but notice that there are some missing, such as hyaluronic acid. The price is also appealing, so it may be a good choice for many. Mark Stevens	reviewed Nature's Bounty	on October 26th	 and gave it a rating of 2.5.